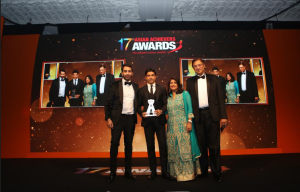 London, UK – The winners of the influential 17th annual Asian Achievers Awards were celebrated amid a ray of Bollywood stars, glittering celebrities and high profile dignitaries on Friday September 22nd at London’s Grosvenor House Hotel on Park Lane. Winners include, Bollywood star Farhan Akhtar for International Personality of the Year (Male); Playwright Tanika Gupta MBE for Achievement in Media; Surinder Arora for Business Person of the Year; with the Lifetime Achievement Award presented to Lord Indarjit Singh CBE, for his immense achievements and contribution to harmonising race relations in Britain. Hosted by Bollywood singer, actress and model, Raageshwari and former Eastenders star actor Nitin Ganatra, the awards saw over £155,000 raised for charity partner, Akshaya Patra, which works to eradicate classroom hunger and facilitate childhood education by serving freshly cooked, nourishing lunches to 1.6 million school children across India every day. The event also highlighted the great strides made in the fields of Media, Art and Culture.